I've branched out to the six string guitars lately. I like the Telecasters better than the stratocasters. I guess it's the old mojo Leo Fender feel you get from the tele. The one on the left is the asian Squier version with souped up volume and tone pots. That's " Blackie" "Whitey" on the right is a very well built Japanese copy from the late 60's or 70's. It needed some wiring and still needs a good pickup switch. Check out the diabolical workshop on Youtube. I thought you were going to show us some six string basses! I thought we were going to need an intervention! Nice, Bob! 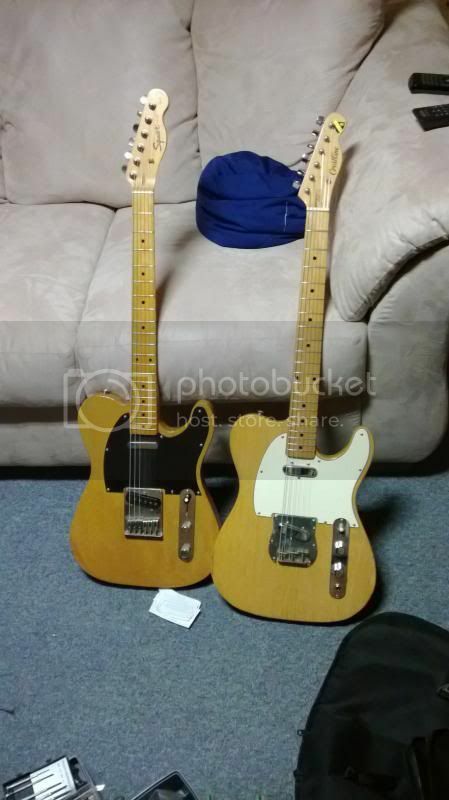 That Tele on the left looks exactly like the USA made '76 Tele I had as a kid. I completely regret selling that guitar. Worst sale I ever made. The only electric guitar I have held onto is my repro '72 Custom Tele just like Keith Richards' guitar. I relly wish that I had gone further with the 'lectric, who knows? Maybe I'll get it back out of the closet one day. Those are some good looking axes! Here is my favorite TELE.